A recent project took us to the Gene Stratton-Porter State Historic Site in Rome City. The Historic Site has acquired a neighboring farm. The agricultural field of about 70 acres is being restored to the natural landscape it once was. Still in its early stages, a short grass prairie is beginning to look like it’s been there for years, like it belongs…because it does! Five scattered wetlands have been restored through a process of breaking drainage tiles and moving earth to create low dams. open water of the wetlands and the adjacent prairie installation. 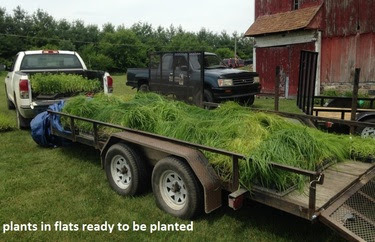 In late June and early July, BHM made five trips with varying crew sizes to plant 2 x 2 inch plugs of native wetland species of sedges, rushes, and of course, forbs…nearly 30 species in all. 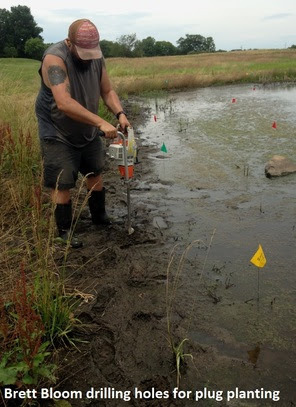 We procured over 4,000 wetland plant plugs from Heartland Restoration Services in Fort Wayne and another nearly 1,000 plugs were gifted by the Indiana Chapter of The Nature Conservancy, left over from a project they had completed. Thank you TNC! standing water, one along the muddy edge, and one just a little higher above the mud flats. A gas-powered auger with a three inch bit facilitated the placing of plugs. In deeper water, the plants were cut in with long bladed planting knives. While working, we encountered numerous side attractions which added to what could have been monotonous work of plugging plants. Leopard frogs were active along shorelines and bullfrogs were “baroooooming” out in open water. A harrier flew by giving its characteristic call note and that of a spotted sandpaper broke the silence and revealed its teetering poster across the water. We’d occasionally chase a family of mallards around the ponds, not intentionally, but as we circled the wetlands with flats of plants, the ducklings and mama kept a safe distance going from side to side. 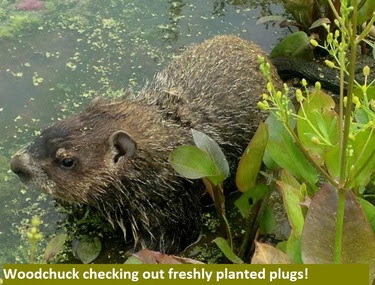 The most unusual sight for me, a mammal checking out our freshly planted greenery, was an adult woodchuck! It allowed me to walk right up to it! A woodchuck in water might partly be like a fish out of water. It eventually had enough and exited the water and laid a soggy trail to some distant hole in the prairie. There were also Dave Fox and Tiffany Conrad sightings! Dave and Tiffany are site manager and site interpreter at GSP. They came by a couple of times to get photos, take measurements for laying strings to prevent geese encroachment, and mostly to share their excitement and that of their staff, volunteers, and public. We look forward to our return visits to monitor success of the project as the wetland sedges, bulrushes, grasses, and wildflowers establish, spread, and fill in the wetland edges. We think Gene Stratton Porter would have approved the restoration work and we think you will too. Consider taking a hike with your family! The first man heard these strong words from his Creator as a result of his rebellion. And the world has never been the same. I am often reminded of this part of the Story when we work to restore vitality, diversity, and beauty to wild places in and around northeast Indiana. Basically, the work of ecological restoration is to undo, bit by bit, the curse. Or as Scot McKnight writes in Blue Parakeet, “A Jesus community undoes the distortions of the fall because it seeks to live out the fullness of the Story.” Much of the work of Blue Heron Ministries is removal of weeds (or plants we deem unfit because they do not belong) from areas in which we want to see desirable or native plants and plant communities thrive. Thistle. And we do. But it is also time to harvest berries. Black raspberries. Red raspberries. And gooseberries. Black raspberry brambles have spread along the fencerow at the edge of our prairie. Red raspberry canes arch (and spread) over wire supports in our garden. We planted three gooseberry bushes in our garden twelve years ago after transplanting them time after time as we moved from home to home over the years…an original gift from a friend. It is a good year for berries. After a bad year for gooseberries last year, this has been a bumper crop year. But all three have something in common. Thorns! They grab and scratch and poke and don’t seem to let go. And yet, the work and the sweat do yield a wonderful prize. Black raspberries, red raspberries and gooseberries for fresh eating on summer fruit salads, warm crumble-topped pies, jars of sugary jam, and frozen for winter treats. I enjoy the fruit of the scratchy, pokey, sweaty labor. I wonder if maybe the curse is lifting a bit. I wonder if sweet berries (yes, gooseberries are “sweet” if you wait to collect them when they are pink-to-maroon and ripe). I wonder if the death and resurrection of Jesus inaugurated the coming of his Kingdom on earth….such that we can see and taste some goodness in those thorns and thistles. And I look forward to the day when the curse is finally lifted for good. It might be a day when new and thornless varieties of my beloved fruit will abound. That will be a sweet day indeed! Blue Heron Ministries hopes to fill one field steward internship position for the remainder of the 2017 field season. We are a nonprofit Christian land conservation organization based in Angola, Indiana. Term will be September 5 thru December 15 (flexible). If the internship is a fit both ways and if projected workload is adequate, the internship may evolve into a full time field position in 2018. Invasive species control predominantly in wetlands in Steuben and LaGrange and surrounding counties (Indiana and Michigan). Some travel for distant projects (up to 3 hours) will also be likely. Control of herbaceous and woody invasives (i.e. reed canary grass, common reed, autumn olive, bush honeysuckle, etc.) will involve herbicide applications. The intern will participate in Blue Heron Ministries’ prescribed fire team (late summer and fall). Prairie and wetland seed collection and installation projects are a minor component of our work, as well. Work conditions will be cold or hot, wet, and poisonous (sumac and Massasaugas)…but where else can you enjoy the presence of God while caring for His creation in such a tangible way? Intern must have a positive attitude, the willingness to learn and take direction, the ability to work independently and with a crew, and possess an attention to detail. No experience necessary. Intern will obtain an Indiana pesticide applicator’s license during the internship. Send resumes to stuartbheron1@hotmail.com Attn: Nate Simons by August 21, 2017. Applicants will be called for interviews later that following week. There have been lots of changes at LaGrange County Parks’ Duff Lake Fen, over the last few years. This area was previously grazed by cattle and has undergone various steps to restore its natural features. John Brittenham will lead us through the fen, as we learn about the restoration process and see what’s in bloom. We’ll meet in the parking lot of Pine Knob Park (2825 E SR 120 Howe, IN 46746) at 10AM. This unusually warm and snowless mid-winter has given Blue Heron Ministries a jump on our “spring” burn season for prescription fires. The main goal of fire, of course, is the ecological benefits it brings to native landscapes, checking back the non-natives and enhancing conditions for native plants to thrive. We also do it to clear the land of last year’s plants making it easier to spread seed or treat certain plants remaining with herbicide. The project boards in the Blue Heron office show about 40 prescribed burns hoping to get accomplished this spring. Getting the early jump has been helpful. While a skilled and trained team to do the actual burns is required, much work takes place before fire reaches the ground. Detailed burn plans for each individual burn considers overall objectives, then addresses the potential fuel, area size, local conditions, surrounding properties, the required crew size, resources and weather conditions needed to accomplish. Even with all of the pre-work done, on-site, day-of-burn conditions are still ascertained. Fuel conditions are studied and immediate weather condition are taken with wind speed and direction indicators, thermometer, and a sling psychrometer for determining relative humidity. It all has to be the right conditions. When all is acceptable, the site is walked by the crew, site maps in hand, discussing the plan and what can be expected. When that is done, teams take their positions and the burn begins. The speed of work is determined by the immediate weather and how the fire is responding. Perfect conditions allow for steady progress. More difficult conditions take more time. Slow and steady for safety is always the key. When complete, the burned area with crisp fire breaks, is a thing of beauty. We take a moment to take it in as we do our after action review and make notes of the fire behavior, how we handled developments during the burn, and what we might do differently next time. The real beauty though lies ahead when the plants and the landscape respond with new growth, flowers, and fruits. Watch for details of our demonstration burn coming up on Saturday, April 8, 2017.